A well structured potting mix will be relatively light and friable. It will have good drainage, allowing for proper aeration of plant roots. It will hold water, preventing plants from drying out on hot summer days. It should also be stable, maintaining a healthy growing structure all season, or even into subsequent seasons. When looking at a "potting" mix you are looking at a variety of components that each have their own unique physical characteristics. Water retention, drainage, pore spacing, wicking capability, resistance to decomposition. These are all things that must be considered. Plants growing in a container have very limited access to moisture. Often their root systems span only a few inches of area. Add to this the extreme temperature fluctuations that occur in above ground containers and you have a recipe for water stress! To keep up, the potting mix medium needs to provide consistent moisture. Additives like peat moss or vermiculite retain lots of water, ensuring your plant stays hydrated. Thus, they have been used by the horticultural industry with great success for decades. But they may be prone to compaction or lack good pore spacing. Pores or small air gaps in a potting mix allow a plant's root to access oxygen which the plant needs during respiration. So wood bark or perlite are commonly included to provide the needed aeration. These physical characteristics must be balanced out before going to the next step of pH adjustment and fertilization. INORGANIC (NON-CARBON BASED) MATTER is not prone to bacterial breakdown and decomposition. Particle size could range from small (sand / perlite) to much larger particles (pumice / expanded clay / growstones). Inclusion of inorganics may provide a source of trace minerals. But most often, inorganic components are selected for their physical properties. They may prevent compaction, improve drainage, improve aeration and even help to retain nutrients. HUMIC ORGANIC (CARBON-BASED) MATTER has already gone through its initial stages of degradation. The remaining material has reached a point of relative stability. Humus often provides the bulk of potting mixes. It does not lose volume as fast as decaying matter. And since it is stable, it does not tie up nitrogen, causing nitrogen draft. DECAYING ORGANIC MATTER is the primary source of nutrients in conventional, in-ground soil. Examples include kitchen scraps, grass clippings and leaves. From such matter we get, traditional compost and vermi-compost (from worms). Composts could be incorporated into a container. However, the required volume will alter the structure of your potting mix. Attention should be given to the effects on drainage, aeration and water retention. Many container gardeners avoid using compost in pots. If you are wanting to include it, vermi-compost is the best candidate and has been shown to work well. In contrast, organic fertilizers are more potent than compost and can be more easily included in a container mix. Examples include: dried blood, bone meal, kelp, fish emulsion and guano. These require a smaller amount and will not significantly impact the physical characteristics of your mix. 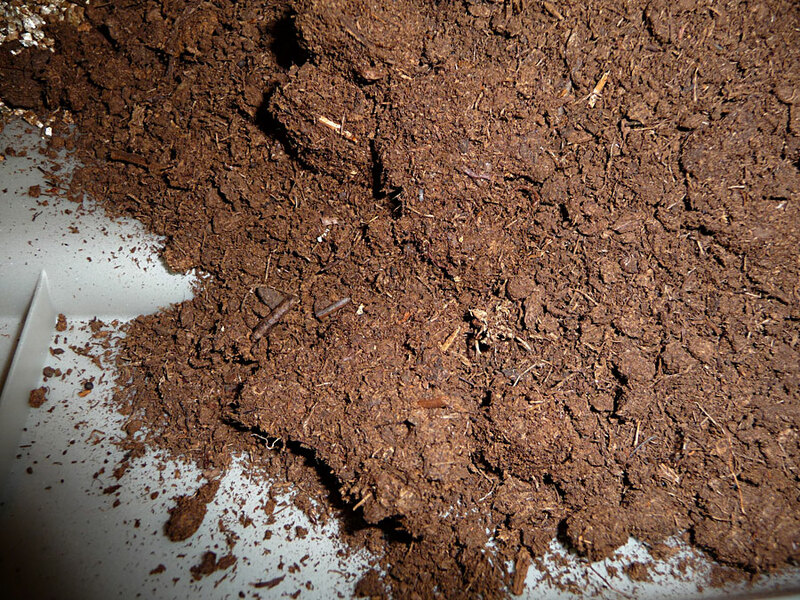 PEAT MOSS [ SPHAGNUM ] - biodegradable, mechanically harvested from wetlands. Water retaining additive for soil or potting mix. It is derived from peat formed by decomposed sphagnum moss. The top layer of living sphagnum moss is removed. 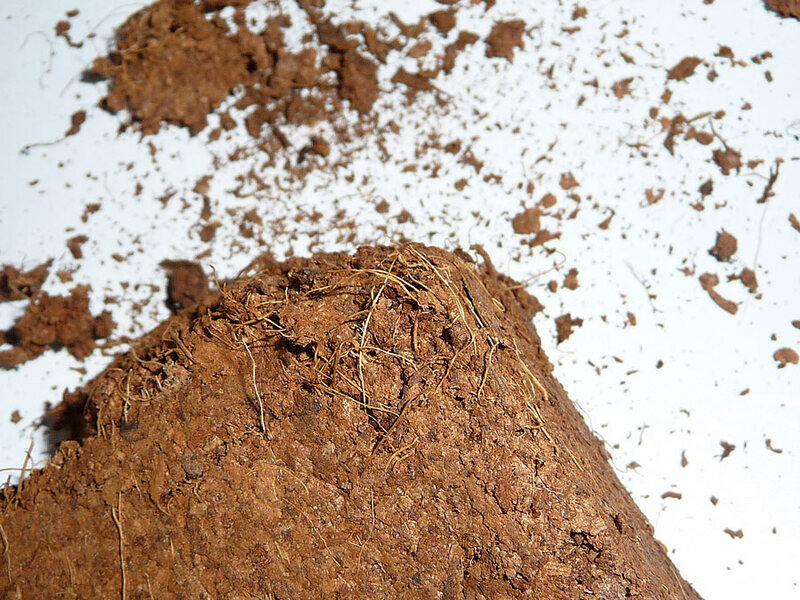 The underlying sphagnum peat, which is dead material, is then harvested. Colors will progress from light to dark to black as it decomposes. It is acidic with a pH 3.5 to 4, but may be balanced with limestone before being sold to the customer. Repels water if allowed to dry out. Too much peat moss can lead to soil compaction. COIR [ COCO ] - biodegradable, industry by-product. Water retaining additive for soil or potting mix. Derived from coconut fibers, it resembles peat moss but is more granular and void of twigs or sticks. The pH ranges from 5.5 to 6.8, with higher potassium, sodium, and chlorine levels. Coir does not break down as quickly peat, but may be more expensive, depending on where you live. It has greater water retention and doesn't repel water like peat can. When fertilizing you may need to use less potassium and more nitrogen. Also, purchase only low-salt coir products to minimize risk of salt damage. COMPOSTED PINE BARK - biodegradable, industry by-product. Additive for soil or potting mix. Pine bark can increase drainage and improve aeration by increasing air space. Composted pine bark is slightly acidic with a pH often ranging from 5.0 to 6.5. Being partly composted, it has already begun to break down and stabilize. Pine bark is a good choice due to its high lignin content. Lignin takes longer to decompose. In contrast, the inner wood of a tree contains higher levels of cellulose, which breaks down quickly and depletes nitrogen in the process. You may still need extra nitrogen supplementation with pine bark, but it is a viable additive for mixes. It can be very cost effective too, depending on local availability. Use only dark, shredded bark, free of dyes. I recommend pine, 1/8" to 1/2" pieces. PERLITE - non-degradable, mined volcanic glass (SiO2) which is super heated and expanded. Perlite is a very common additive for soil or potting mix to enhance drainage & aeration. Used more often with containers, perlite is produced from volcanic rock that is heated and expanded into a hard, lightweight, white material. It is sterile and pH-neutral. Adding perlite results in tiny air tunnels for water and air to flow freely to plant roots. 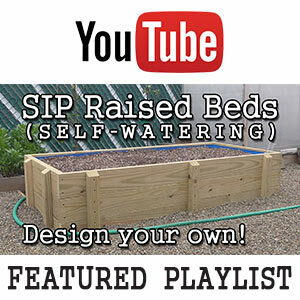 It is much lighter than sand and the preferred solution for drainage in container gardening. Perlite can hold from three to four times its weight in water without getting soggy. VERMICULITE -non-degradable, mined aluminum-iron magnesium silicate. Added to soil or potting mix because of its water retaining properties (220 to 325% by weight). The pH is basically neutral (7.0) but it contains carbonate compounds, which can result in alkaline characteristics. So a typical pH in water can range from 6 to 9. Particles are flaky & can break into smaller pieces if the soil is mixed too much or handled roughly, leading to compaction. 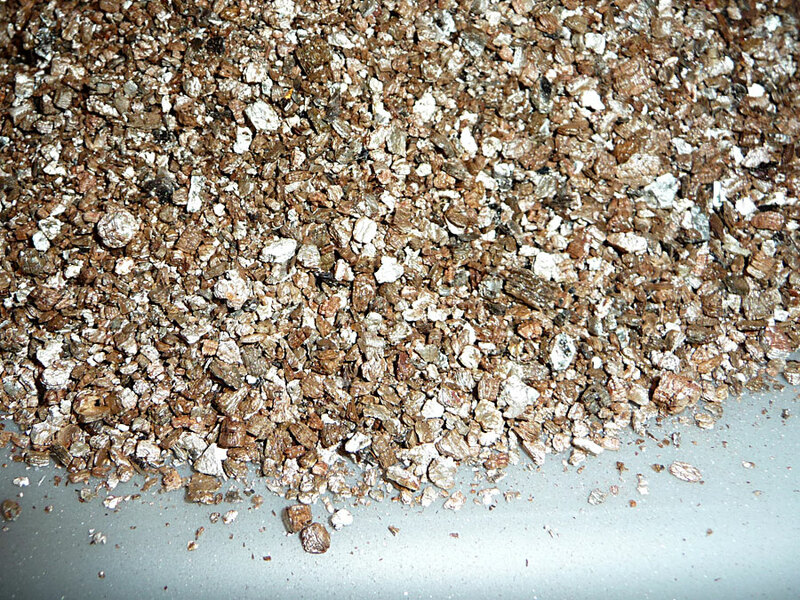 Mel's Mix is a common raised bed formulation which uses 1/3 vermiculite. GROWSTONE -non-degradable, derived from recycled glass. Useful in hydroponics and potting mixes because of its aeration and water retaining properties. Growstones are a much more sustainable option when compared to mining minerals such as perlite. 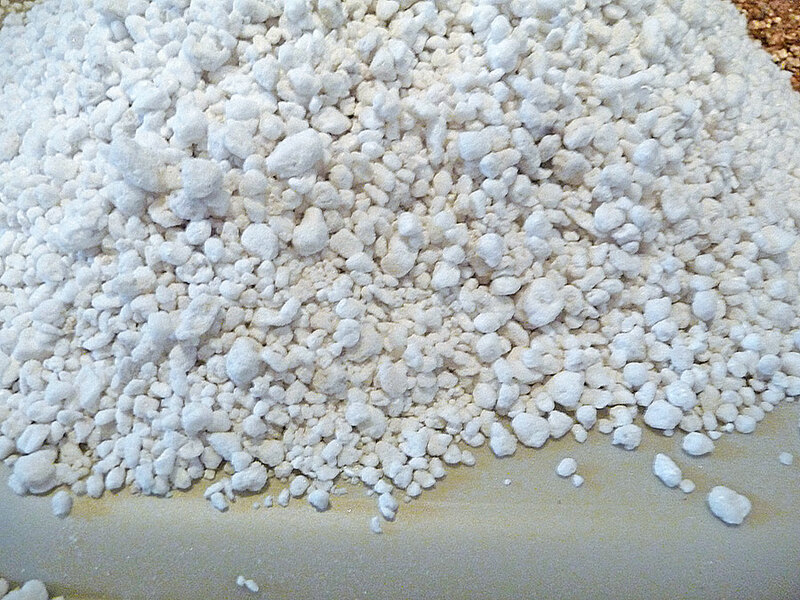 Compared to perlite, growstones boast 70% more aeration and a much stronger physical integrity. Before the initial use, they need to be rinsed. But afterwards, they can be reused again and again without breaking down.